Two years ago, I started to focus on exploring ways that we might evolve the C++ language itself to make C++ programming both more powerful and simpler. The only way to accomplish both of those goals at the same time is by adding abstractions that let programmers directly express their intent—to elevate comments and documentation to testable code, and elevate coding patterns and idioms into compiler-checkable declarations. The work came up with several potential candidate features where judiciously adding some power to the language could simplify code dramatically, while staying true to C++'s core values of efficient abstraction, closeness to hardware, and the zero-overhead principle. The first two potential candidate features from that work to be further developed and proposed for ISO C++ are the ＜=＞ unified comparison operator (minor) and what I've provisionally called "metaclasses" as a way to generatively write C++ types (major). This talk is about the latter, and includes design motivation, current progress, and some live online compiler demos using the prototype Clang-based compiler built by Andrew Sutton and hosted at godbolt.org. Engineering is programming integrated over time. That is to say, as much as it can be difficult to get your code to build and run correctly, it is manifestly harder to keep it working in the face of changing assumptions and requirements. This is true no matter the scale, from a small program to a shared library. Only two solutions have been shown to be theoretically sound: never change or provide no compatibility guarantees. What if there were a third option? What if we took the question of maintenance out of the realm of theory and moved it to practice? This talk discusses the approach we've used at Google and how that intersects with other languages, package management, API and ABI compatibility, and a host of other software engineering practices. The particulars of C++ as a language and an ecosystem make it well positioned for a different approach: Live at Head. 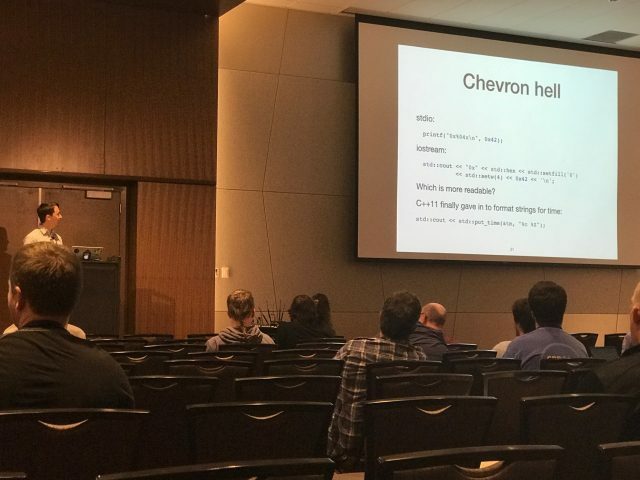 At #CPPCON2017 Day 3, I spent most of the time on the meetings of SG14 (on games and low-latency stuff); while it was certainly useful for me – the most interesting things on Day 3 happened outside of SG14. At CPPCON2017 Day 2, two talks were of special interest to me. One was a 2-hour talk about Local Allocators – and another about C++17 STL parallelised algorithms. Cppcon 2017 opening keynote by Bjarne Stroustrup is now live. We – attendees at CppCon – are all teachers. Some teach for a living; many occasionally teach a course or give a lecture; essentially all give advice about how to learn C++ or how to use C++. The communities we address are incredibly diverse. What do we teach, and why? Who do we teach, and how? What is “modern C++”? How do we avoid pushing our own mistakes onto innocent learners? Teaching C++ implies a view of what C++ is; there is no value-neutral teaching. What teaching tools and support do we need? Consider libraries, compiler support, and tools for learners. This talk asks a lot of questions and offers a few answers. Its aim is to start a discussion, so the Q&A will be relatively long. It will take place at Indizen's offices in Madrid on October the 10th. A new library is out! Today we are open sourcing Abseil, a collection of libraries drawn from the most fundamental pieces of Google’s internal codebase. These libraries are the nuts-and-bolts that underpin almost everything that Google runs. Bits and pieces of these APIs are embedded in most of our open source projects, and now we have brought them together into one comprehensive project. Abseil encompasses the most basic building blocks of Google’s codebase: code that is production tested and will be fully maintained for years to come. IMO, the most important thing which has happened on Day 1 was a series of discussions about potential replacement for overloaded operator << in iostreams <yay! />. The new Cppcon is here! Very short report from day 0 of CPPCON2017. Registration reception was lively (with Gor Nishanov being the star of the show, but lots of the other interesting people were noticed, I even spotted <da-dum /> Bjarne Himself).